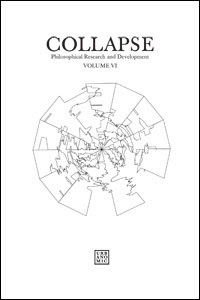 "Following Collapse V's inquiry into the legacy of Copernicus' deposing of Earth from its central position in the cosmos, Collapse VI: Geo/philosophy poses the question: Is there nevertheless an enduring bond between philosophical thought and its terrestrial support, or conversely, is philosophy's task to escape the planetary horizon? Following early-modern geophilosophical experiments in utopia, geographies and cartographies real and imaginary have played a double role in philosophy, serving both as governing metaphor and as an ultimate grounding for philosophical thought. Collapse VI: Geo/philosophy begins with the provisional premise that the Earth does not square elements of thought but rather rounds them up into a continuous spatial and geographical horizon. Geophilosophy is thus not necessarily the philosophy of the earth as a round object of thought but rather the philosophy of all that can be rounded as an (or the) earth. But in that case, what is the connection between the empirical earth, the contingent material support of human thinking, and the abstract 'world' that is the condition for a 'whole' of thought? 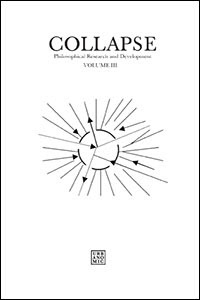 Urgent contemporary concerns introduce new dimensions to this problem: The complicity of Capitalism and Science concomitant with the nomadic remobilization of global Capital has caused mutations in the field of the territorial, shifting and scrambling the determinations that subtended modern conceptions of the nation-state and territorial formations. And scientific predictions presents us with the possibility of a planet contemplating itself without humans, or of an abyssal cosmos that abides without Earth - these are the vectors of relative and absolute deterritorialization which nourish the twenty-first century apocalyptic imagination. Obviously, no geophilosophy can remain oblivious to the unilateral nature of such un-earthing processes. Furthermore, the rise of so-called rogue states which sabotage their own territorial formation in order to militantly withstand the proliferation of global capitalism calls for an extensive renegotiation of geophilosophical concepts in regard to territorializing forces and the State. Can traditions of geophilosophical thought provide an analysis that escapes the often flawed, sentimental or cryptoreligious fashions in which popular discourse casts these catastrophic developments? Collapse VI brings together philosophers, theorists, eco-critics, leading scientific experts in climate change, and artists whose work interrogates the link between philosophical thought, geography and cartography, in order to create a portrait of the present state of 'planetary thought'. ROBIN MACKAY: Editorial Introduction. NICOLA MASCIANDARO Becoming Spice: Commentary as Geophilosophy. IAIN HAMILTON GRANT Introduction to Schelling's On the World Soul. F. W. J. SCHELLING On the World Soul (Extract). GREG MCINERNY, DREW PURVES, RICH WILLIAMS, STEPHEN EMMOTT New Ecologies (Interview). 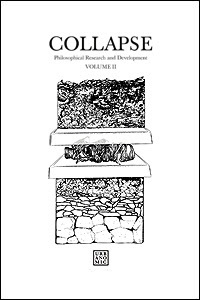 Collapse III contains explorations of the work of Gilles Deleuze by pioneering thinkers in the fields of philosophy, aesthetics, music and architecture. In addition, we publish in this volume two previously untranslated texts by Deleuze himself, along with a fascinating piece of vintage science fiction from one of his more obscure influences. Finally, as an annex to Collapse Volume II, we also include a full transcription of the conference on Speculative Realism held in London in 2007. 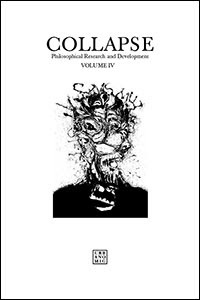 The contributors to this volume aim to clarify, from a variety of perspectives, Deleuze's contribution to philosophy: in what does his philosophical originality lie; what does he appropriate from other philosophers and how does he transform it? And how can the apparently disparate threads of his work to be 'integrated' - what is the precise nature of the constellation of the aesthetic, the conceptual and the political proposed by Gilles Deleuze, and what are the overarching problems in which the numerous philosophical concepts 'signed Deleuze' converge? 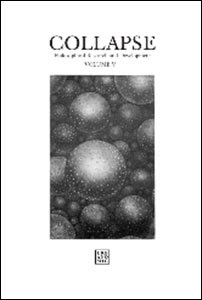 Comprising subjects from probability theory to theology, from quantum theory to neuroscience, from astrophysics to necrology, and involving them in unforeseen and productive syntheses, Collapse II features a selection of speculative essays by some of the foremost young philosophers at work today, together with new work from artists and cinéastes, and searching interviews with leading scientists. Against the tide of institutional balkanisation and specialisation, this volume testifies to a defiant reanimation of the most radical philosophical problematics - the status of the scientific object, metaphysics and its "end", the prospects for a revival of speculative realism, the possibility of phenomenology, transcendence and the divine, the nature of causation, the necessity of contingency - both through a fresh reappropriation of the philosophical tradition and through an openness to its outside. 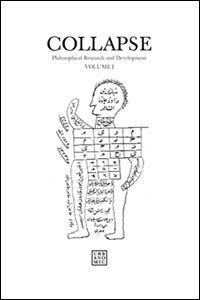 The breadth of philosophical thought in this volume is matched by the surprising and revealing thematic connections that emerge between the philosophers and scientists who have contributed. Collapse is an unprecedented collection of work by leading practitioners in diverse fields of enquiry. Conceived as a meticulously compiled and compendious miscellany, a grimoire or instruction manual without referent, as a delirious carnival of sobriety, Collapse operates its war against good sense not through romantic flight but through the formal insanity secreted in the depths of the rational ("the rational is not reasonable"). Collapse aims to force unforeseen conjunctions, singular correspondences, and unnatural cross-fertilisations; to diagram abstract regions as yet unnamed. The first volume of Collapse investigates the nature and philosophical uses of number through interviews with philosophers scientists and mathematicians, essays on the mathematics of intensity, terrorism, the occult and information theory, and graphical works of multiplicity.